Quick decisions! Fixing things that were broken! Scaling things that worked! What does any of that mean? Nobody knows! Probably Kushner doesn’t even know, though he has tapped into the now age-old technique favored by Silicon Valley wunderkinds: successfully marketing everything you do to make it appear impressive and new. 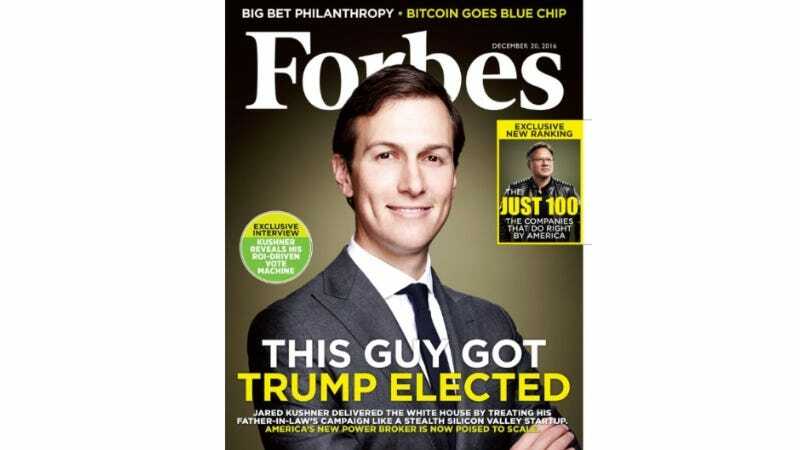 “It’s hard to overstate and hard to summarize Jared’s role in the campaign,” venture-capital vampire Peter Thiel told Forbes. (You don’t say.) “If Trump was the CEO, Jared was effectively the chief operating officer.” Oh, well that explains it. Jared and Ivanka met at a business lunch and started dating in 2007. During the courtship Kushner had met Donald only a few times in passing when, sensing the relationship was getting serious, he asked Trump for a meeting. Over lunch at the Trump Grill (which Trump briefly made a household name with his infamous taco bowl tweet), they discussed the couple’s future. “I said, ‘Ivanka and I are getting serious, and we’re starting go down that path,’” Kushner says and laughs.